GP Connect is a service that allows GP practices and authorised clinical staff to share and view GP practice clinical information and data between IT systems, quickly and efficiently. 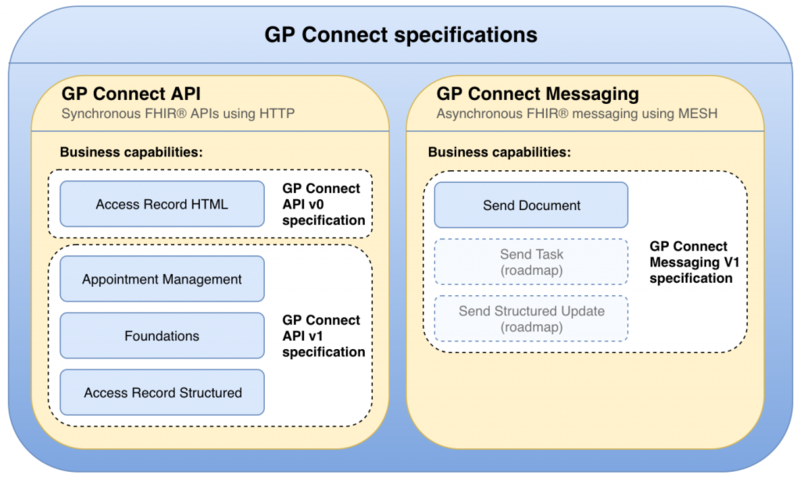 The page below lists current, upcoming and previous versions of GP Connect API and Messaging specifications. Which specification do I need? Draft GP Connect API 1.2.3-rc 29 Mar 2019 Appointments Foundations Access Record Structured Fixes and clarifications to the Appointments and Access Record Structured capabilities, and to the core elements of the specification (such as SDS queries). Current v1 GP Connect API 1.2.2 26 Oct 2018 Appointments Foundations Access Record Structured Fixes and clarifications to the Appointments and Access Record Structured capabilities. → This version is also available on GitHub Pages. Draft GP Connect API 0.5.2-rc 29 Mar 2019 Access Record HTML Core changes introduced into the 1.2.3 specification (such as SDS queries) have been integrated into this specification. Also contains a small number of clarifications to the Access Record HTML capability. Current v0 GP Connect API 0.5.1 17 Dec 2018 Access Record HTML This release is aimed at consumers, and provides information to understand the variance in HTML output between provider systems. There are no material changes for provider requirements or API definition. Current GP Connect Messaging 1.2.0 4 Feb 2019 Send Document GP Connect Messaging (Send Document capability only) STU3 release. The specifications below are currently for GP Connect providers ONLY in order for them to build new versions of the GP Connect API. At a point in the future when these APIs are built, these versions will become current and available for GP Connect consumers also. Draft GP Connect API 0.7.2-rc 4 Feb 2019 Access Record HTML Core changes introduced into the 1.2.3 specification (such as SDS queries) have been integrated into this specification. Also contains a small number of clarifications and changes to the Access Record HTML capability. Future v0 GP Connect API 0.7.1 29 Mar 2019 Access Record HTML This release contains a change to the Medications view and other improvements to help support consumers.